A limestone relief dating back to the reign of the Egyptian King Seti I of the New Kingdom was recovered on Monday from an auction hall in London after two months of negotiations. Minister of Antiquities Mamdouh Eldamaty told Ahram Online that the ministry was informed about the relief by the curator at the British Museum, Marcel Marée. Marée sent a photograph of the piece to the ministry asking for its authenticity after it was put on display in the London auction hall. Eldamaty assigned an archeological committee to inspect the relief, which later confirmed its authenticity. A report was then filed with Egypt’s Tourism and Antiquities Police and a similar one was sent to Interpol in order to stop the sale of the relief. Ali Ahmed, the director of the Recuperation of Antiquities Department, explained that the relief was then confiscated by the British police and arrived to the homeland today. The relief is now under restoration at the laboratories of the Egyptian Museum in Tahrir. Ahmed explained that the relief was stolen due to illegal excavations. The relief is engraved with a scene depicting the 19th dynasty King Seti I before the goddess Hathor and the god Web Wawat. It also bears hieroglyphic text and the names of several ancient Egyptian deities from what is now the Assiut governorate in Upper Egypt. 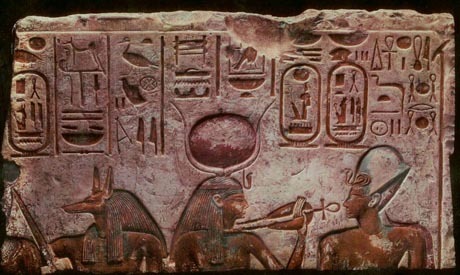 “It is a very important relief as it depicts a not yet discovered temple of King Seti I in Assiut,” Ahmed pointed out.